Most Champaign-Urbana area public swimming pools and aquatic centers are preparing for the summer season ahead. All outdoor facilities open around Memorial Day weekend, this year May 25-27. If we’ve missed your local pool, please let us know. Please note, we are not responsible for price changes. Season: Memorial Day Weekend to Labor Day, with some reduced and/or limited hours (primarily when Champaign Unit 4 schools are in session). Highlights: Don’t forget the Tiny Tots program (which is 7 days a week), and the Champaign Park District has instituted $4 Fridays: Residents can swim for $4 all day every Friday ($6 for non-residents). Children 3 and under are FREE. Regular Hours: Monday-Friday: 12:30 – 7 p.m.
; Weekends: 11:30 a.m. to 7 p.m. (open until 8 p.m. in July); Early Bird Time: (season pass holders only) Weekdays noon-12:30 p.m., weekends 11-11:30 a.m.
Sholem is only open from 4-7 p.m. on weekdays when Unit 4 resumes school in August until Labor Day when they close for the season. Weekend hours will remain at 11 a.m. to 7 p.m. until Labor Day when they close for the season. Daily Pass Price: Individuals, $6 resident/$9 non-resident, after 4 p.m. $4/$6; kids 3 and under FREE. Discounted punch cards are available. Season Pass Prices: Click here for full details regarding season passes. Ready to plan your trip to Sholem? See our Mom review of Sholem Aquatic Center here. Toddler Swim Monday – Friday 8 – 11 a.m.
Open Swim Saturday/Sunday 11 a.m. – 8 p.m. Lap Swim Monday – Friday 6 – 8 a.m., 11 a.m. – 1 p.m.
Open Swim Monday – Friday 4 – 7 p.m.
Open Swim Saturday/Sunday 11 a.m. – 7 p.m.
Daily Pass Price: Individuals, $6 resident/$9 non-resident, after 5 p.m. $4/$6; kids 3 and under free; Tuesdays are also $4/6. Discounted punch cards are available. See our Mom Review of Urbana’s Crystal Lake Family Aquatic Center here. Location:Burke Park at 601 W. Railroad St. Season: May 27 (Memorial Day) to mid-August. Notes: If a storm occurs late afternoon, the facility may remain closed for the evening. Call ahead to check if you are coming from out of town 762-2415. See our Mom Review of the Monticello Family Aquatic Center here. Location: 333 S. Tanner St. Season: Opening day is May 25. Closing day is TBD. Regular Hours: Monday-Friday, 1 to 7 p.m.; Saturday and Sunday, noon to 7 p.m.
Daily Pass Price: Ages 3-64 $6, 65 and older $5. 2 and under, FREE with paying adult. No credit/debit cards taken. Season Pass Prices: Individuals (ages 3-64) $100; Seniors (65+) $80; Family $250 (up to 4 members living in same household ($40 each additional member, but 2 and under free. See our Mom Review of the Hap Parker Family Aquatic Center in Rantoul here. *Please note information for the Tuscola pool is from 2018. Updated information will be provided as soon as it becomes available. Regular Hours: Daily (weather permitting) 12:30 – 7:30 p.m.
Daily Pass Price: $4 per person; book of 10 passes available for $30. No credit/debit cards taken. EVERYONE being admitted to the pool is required to pay admission. Season Pass Prices: Passes go on sale May 1 and can be purchased at City Hall (214 N. Main Street) until the pool opens. See our Mom Review of the Tuscola Swimming Pool here. *Please note information for the Paxton pool is from 2018. Updated information will be provided as soon as it becomes available. Public Hours: Open swim 1 to 5:30 p.m. and 8 to 10 p.m. Monday through Thursday; 1 to 5 p.m. Friday-Sunday. Tot Swim hours are 10 to 11:30 a.m. Monday, Wednesday, and Friday. Tot Splash Time: Beginning the week of July 24, the wading (baby) pool will be open every Monday, Wednesday and Friday from 10 to 11:30 a.m. for kids ages 5 and under and their parent(s). Pre-registration not required, nor is a pool pass needed. Bring your own toys and enjoy cooling off during these hours that are set aside just for you and your little one! More information on Tot Splash Time can be found here. Daily Pass Price: $4 per person 1 to 5:30, $2 for night time swims; 3 and under FREE with paying adult; $2 seniors 55+; Tot Splash Time Admission: Free with pool pass. $2 without. Season Pass Prices: Season passes will be sold at the gate on the first day the pool is open. Paxton residents can purchase a pool pass for $20 per person. Non-residents pool passes will cost $25 per person. THIS IS A PRORATED PRICE to account for the delay in opening. *Please note information for the Farmer City swimming pool is from 2018. Updated information will be provided as soon as it becomes available. Regular Hours: noon – 8 p.m daily based on weather and attendance. Adult lap swim, 11 a.m. to noon. Indian Acres is a family-oriented swim club in Champaign’s Lincolnshire neighborhood with four pools — 64,000 square feet of sparkling clear water of varying depths. There are more than 8,000 square feet of deck space with several sunny and shaded areas on deck. The pools are surrounded by approximately three acres of play fields, two playgrounds, and picnic areas. Offering day camp, swim team, swim lessons, swim fitness, and recreational swim. For more information on Indian Acres, including day camps and memberships, click here. Looking for Swimming Lessons in the Champaign-Urbana Area? See our Guide to Swimming Lessons here. We also have a list of swim teams in the C-U area. Have little ones at home? 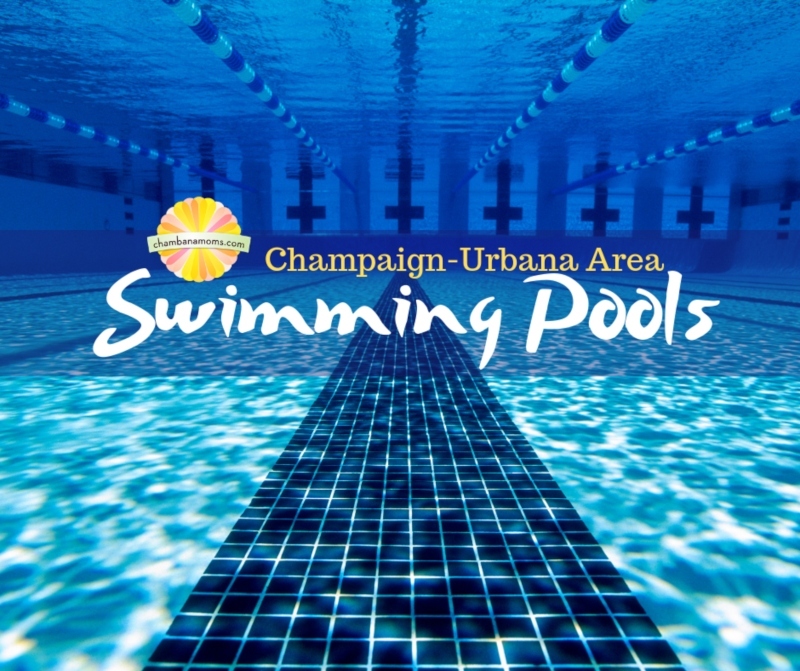 Don’t miss this Best Kept Secret: Toddler/ Baby Swim Times in Champaign-Urbana post!